David Samuel Hanshue1,2,3 [David Samuel Handschu4]. Koehler, Philip, head-of-household, age 66, born Apr 1834 in Pennsylvania; parents born in Pennsylvania; widower; occupation: shoemaker; rented home. Hanshue, Mazie, daughter, age 27, born Aug 1872 in Pennsylvania; parents born in Pennsylvania; married 0 years; no children. 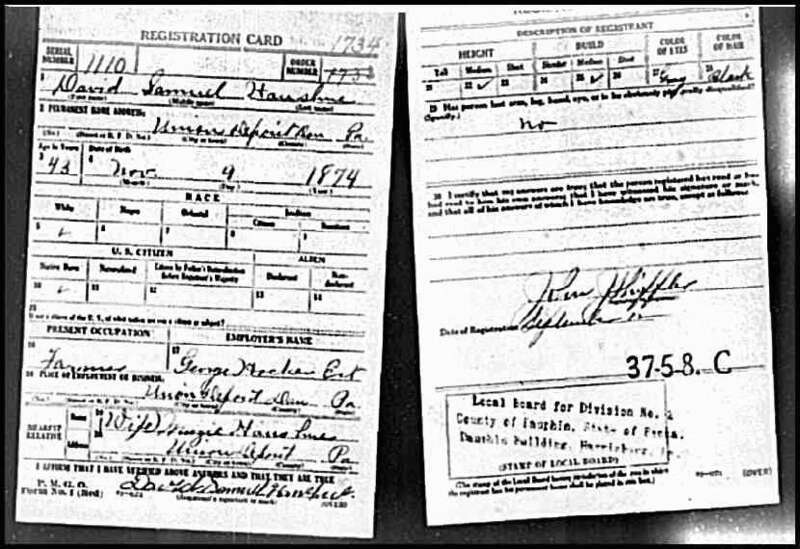 Hanshue, David S., son-in-law, age 25, born Nov 1874 in Pennsylvania; parents born in Pennsylvania; married 0 years; occupation: farm laborer. Hanshue, David S., head-of-household, age 57, born in Pennsylvania; parents born in Pennsylvania; first married at age 27; rented home; radio in home; occupation: laborer, farm; not a war veteran. Hanshue, Mazie I., wife, age 57, born in Pennsylvania; parents born in Pennsylvania; first married at age 27. Contribution from Shirley Hanshue Kurtz. 1880 census, South Hanover Township, Dauphin County, Pennsylvania; roll T9-1124, ED 110, page 113C, line #48, dwelling #69, family #71. 1900 census, South Hanover Township, Dauphin County, Pennsylvania; roll T623-1403, ED 98, page 9B, line #57, dwelling #206, family #212. 1930 census, Union Deposit, South Hanover Township, Dauphin County, Pennsylvania; roll T626-2028, ED 94, page 1B, line #73, dwelling #20, family #20. Contribution from Shirley Hanshue Kurtz ().